Ted Cruz, candidate for Texas Attorney General, is only thinking of what is best for his treasured home state when he says, "As Attorney General, I will fight for each and every Texan, for our rights, for our values, and for our opportunity in the future." The son of a Cuban immigrant, Cruz was raised in Texas and then went on to attend Princeton University and Harvard Law School. Cruz then came back to Texas to lead as the Chief Appellate Lawyer for the state of Texas and represent his home state before both the U.S. and Texas Supreme Courts. When asked why he is running, Ted replied, "We need to rediscover the leadership embodied by President Reagan, and the values that have kept our nation strong, including faith, family, limited government, individual responsibility, and expanding opportunity for every American." In his college debate team years, Cruz was named the U.S. National Speaker of the Year. Cruz has more recently been named by American Lawyer magazine as one of the 50 Best Litigators under 45 in America, hailed as a "rising star" in the Wall Street Journal, and has been the longest serving Solicitor General in Texas. Cruz currently lives in Houston with his wife, Heidi and one-year-old daughter, Caroline. 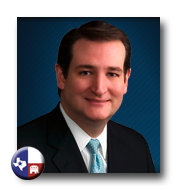 You can follow Ted Cruz updates on Twitter or check out his website.